What is the current Unix timestamp / Unix epoch? The Unix time converter (also referred to as epoch converter or Unix timestamp converter) allows you to convert from UNIX time or Unix epoch time to the corresponding date in any of the time-zones in the world, and vice versa. All time zones are available including the different names by which they are referred to, making it easy to convert the current UNIX timestamp, no matter where or when in the world you are. Unix time or Unix epoch time is the standard way in which computers keep track of time and it consists of a number stored in the computer that gets increased by one every second. In this aspect, the Unix time works in a similar fashion to the day counter calculator but instead of counting days, the Unix epoch time counts seconds. The current Unix time represents the number of seconds that have passed since the 1st January 1970 at 00:00 (UTC/GMT time). This date was chosen as it was (at the time) a fairly recent date that had some importance (change of year) but it was still an arbitrary decision. The usage of Unix time made it easy and fast to keep track of time and sync different systems since it means time is a universal number that should always be the same in all computers independently of the time-zone. To turn that number (fairly difficult to read for humans) into an intelligible date the computer performs a series of calculations, as we do in this epoch time converter, so that instead of the current Unix time number you see a date that makes sense to you. Unix epoch time is not perfect, though. It has two flaws that make it complicated to apply for super precise measurements and mean it would need to be replaced or updated at some point. The first of the problems is that Unix epoch time does not take into account leap seconds. Leap seconds are extra seconds added to some years to account for the slowing down in Earth's rotation, and avoid mismatched between solar time and our 'everyday time' which is currently called Universal Time Coordinated (UTC). 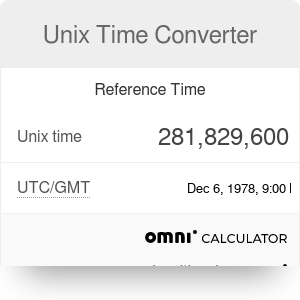 The second problem with Unix time is that the number is stored in computers in such a way that it has an upper limit of 2147483647 which (using the Unix epoch converter) we can see that would correspond to 03:14:07 UTC on 19th January 2038. If we would add one more second to that maximum possible number it would become -2147483647 due to an unavoidable process called integer overflow. After the overflow happens the computer will read a negative current Unix time and will hence show the date to be 13 December 1901 (2147483647 seconds before 1st January 1970). This problem is very similar to the "Year 2000 Problem" and has no universal fix. Luckily, newer systems are being equipped with bigger memory allocated to store the value of Unix time (from int32 to int64) so that this problem will never happen again. One can see using the binary converter calculator that a 64-digit binary number (like int64) can store significantly bigger numbers than a 32-digit (int32) one; in fact, an int64 can store the number of seconds exceeding the current age of the universe. The main way to use the Unix time converter is to convert back and forth any Unix time to/from regular date. It can also be used as a world clock but we recommend the time zone converter for such purpose. We will now explain how to do both things and comment on some tips and tricks to take into account. Using this tool as a Unix timestamp converter, you simply need to introduce the desired date into the corresponding time-zone box and you will get the corresponding value in epoch time; conversely, you can introduce the current Unix time (or your desired one) and see what date it correlates to in your time-zone of interest. Note that Unix epoch time can take any value even though in computers it is generally an integer between -2147483647 and 2147483647. A simple trick for those not familiar with the abbreviations or wanting to use military zones is to hover the mouse over the time zones abbreviations in the Unix epoch converter and wait for the help information to be displayed. This information includes the full name of the time zone, the delay with respect to the reference time zone (GMT/UTC) and the military denomination of such zone. Unix Time Converter can be embedded on your website to enrich the content you wrote and make it easier for your visitors to understand your message.